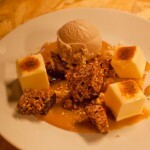 Monopole in Potts Point is a small space (so watch your elbows), but it’s still generous on flavours and ideas. 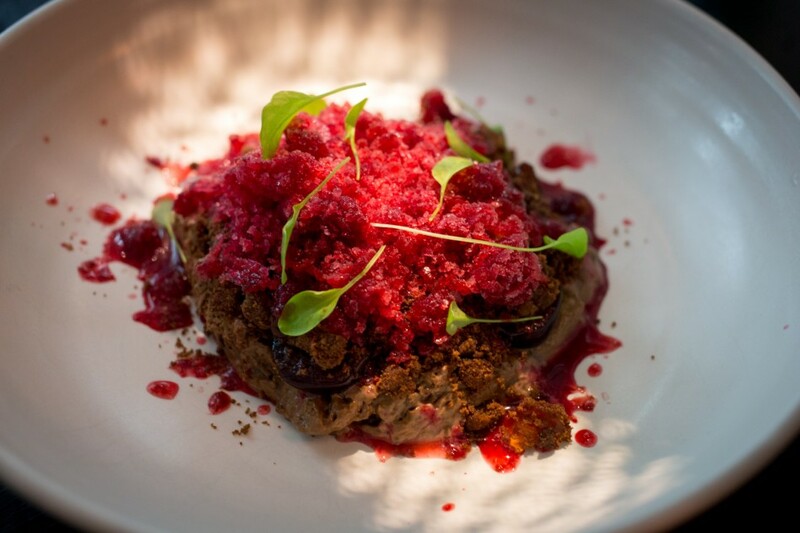 It’s the new venture for Brent Savage, Nick Hildebrandt and Glen Goodwin, the creative forces behind the brilliant, two-hatted Bentley restaurant in Surry Hills. 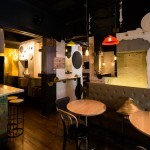 Last week, Monopole opened in the old Sailor’s Thai site; into this narrow Tetris block of a location, its owners have packed in an impressive amount. 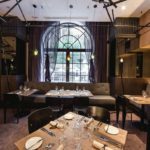 The main attraction is a long bar that borders the open kitchen – this is where all the best seats are (keep your elbows in check, though, as you have to sit snug and close to your neighbouring diners). Here, you get to see the flash and fire of the kitchen – every choreographed squeeze and swirl of ingredients as they hit the plate; hazelnut, briskly grated, showers over grilled scampi like a small-scale dust storm; then there’s the slumber-like lag of ricotta as it’s pushed out of a bag onto lamb shoulder; or you can hear the gritty scrape of frozen sour cherry and yogurt, as the whiskey chocolate mousse dessert is prepared. 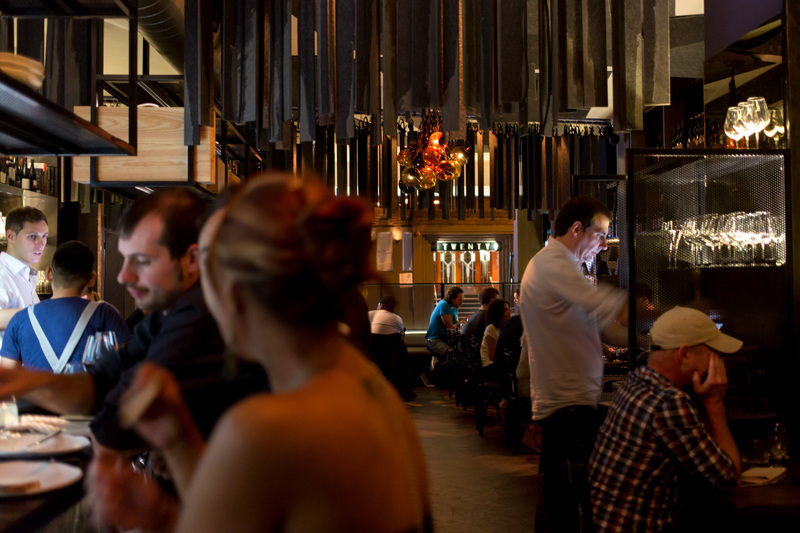 There’s a liveliness to Monopole that stands out from your average eatery. 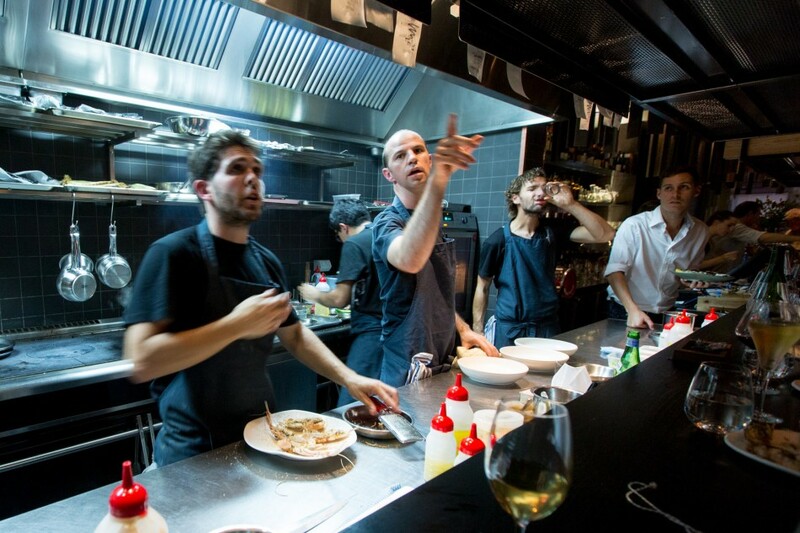 Sitting that close to the flurry of chefs means you get a zoomed-in view of all the meals unfolding – and you get to tap into how everything came together by quizzing the very accomodating staff about all the dishes. 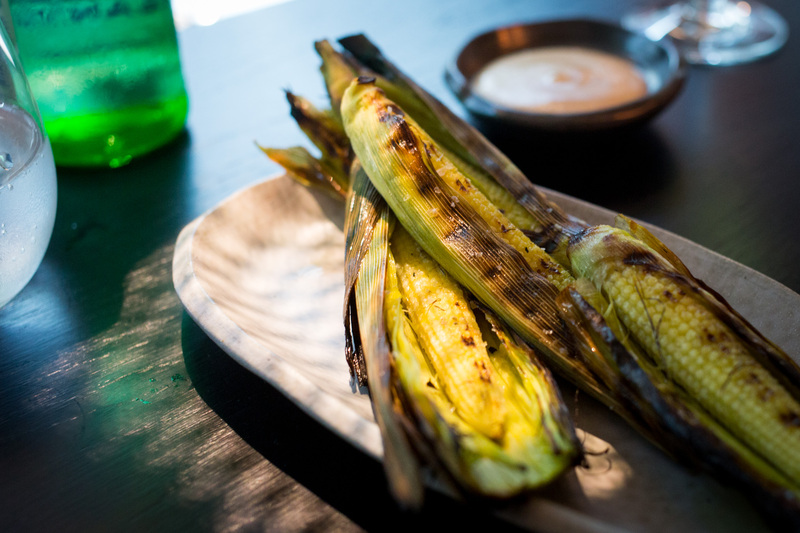 Executive chef Brent Savage might chat about the secret behind the Grilled Baby Sweet Corn with Tamarind Yogurt ($13), a beautifully simple dish that (unlike its not-so-baby counterpart) doesn’t leave you with an awkward kernel-studded smile afterwards. 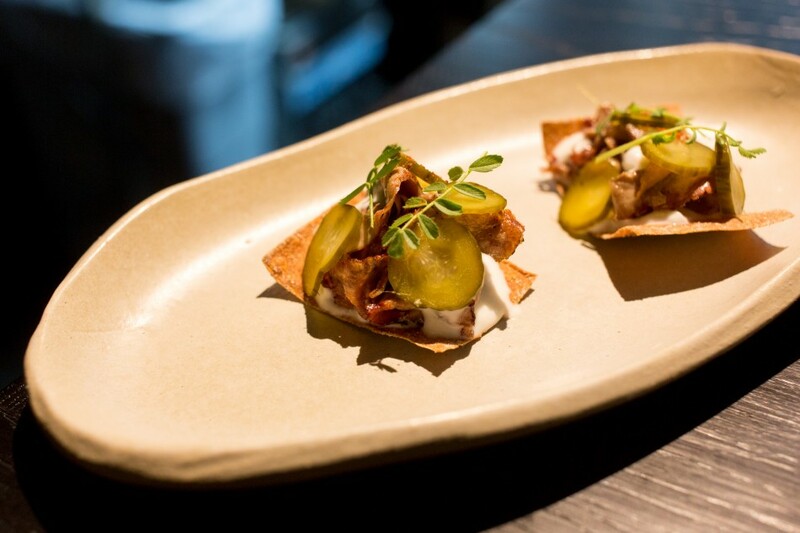 Or head chef Adam Wolfers (est, Marque) will explain how six months was spent on nailing the house-cured meat. 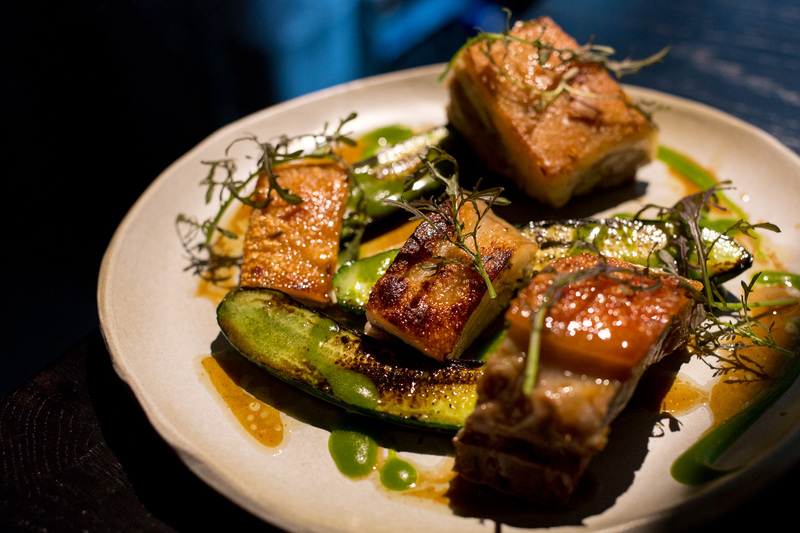 They’re also great at helping you play Ingredient Detective – so, that crisp, curly green atop the Roasted Suckling Pig and Charred Baby Cucumbers ($32) is elk (“it’s a bit like horseradish”) and what looks like a mutant squash is actually an heirloom zucchini. This is from a curious off-menu dish, one of the “tricks” Savage has up his sleeve, if you’re looking for something vegetarian to order. It’s served with jacket potato, pickled raisin, a dressing of confit garlic and maple syrup and the most surprising tomatoes I’ve ever had. They’re brined for a week and then “kissed” on the grill – so unlike something deeply charred and caramelly, you bite in and the tomatoes are still sweet and a balloon-burst of juice. Monopole has this way of airlifting flavours out of seemingly ‘ordinary’ ingredients; and the main difference between this venture and Bentley is that its predecessor runs on high-tech dazzle to turn out its fascinating dishes, while Monopole works on a simpler scale, with a focus on great and unexpected produce (like the hard-to-find baby corn). There’s still a convention-defying element, but that might come from something “lo-fi” (like the grated hazelnut, or the brined tomato). 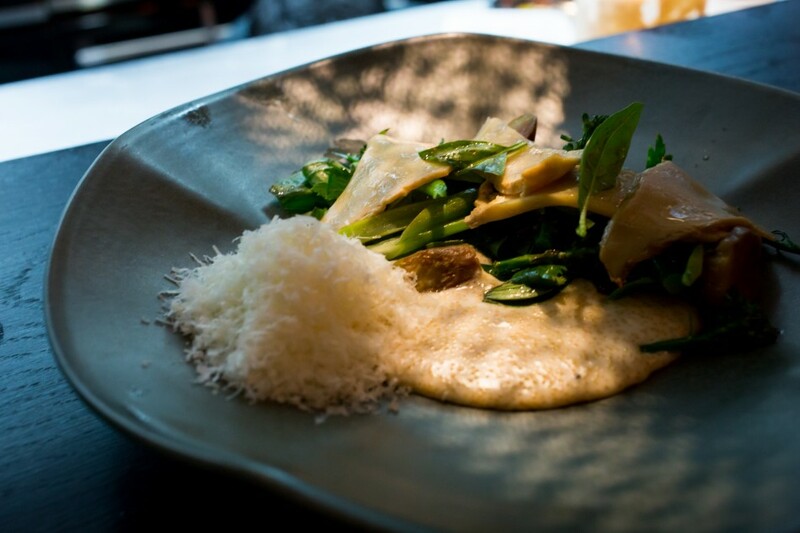 And not every dish has to be overspun with ambition, either – Will loved the simplicity of the Roasted Suckling Pig, while the Amaranth Cooked in Milk with Broccolini, Parmesan and Oyster Mushroom ($24) just hit the right comfort levels. 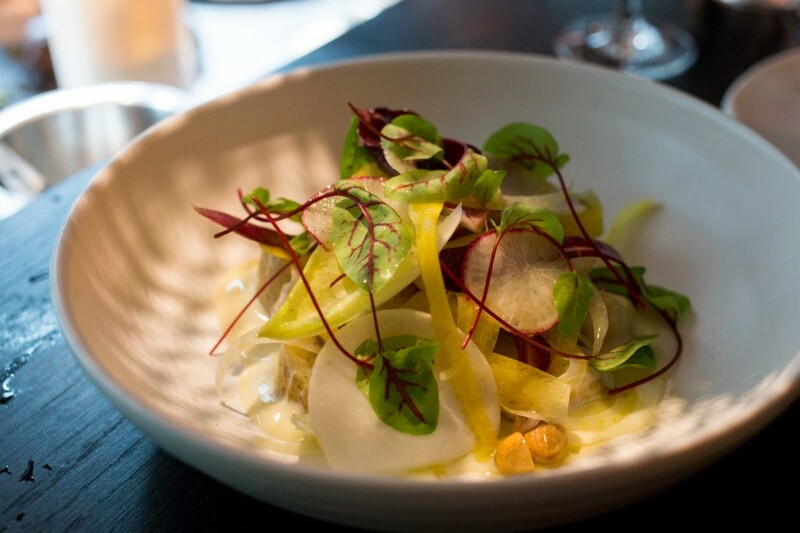 And while Monopole is technically a wine bar, the food is still at the forefront (as it is at Bentley). I mean, the staff members actually custom-designed the grill with an engineer – that’s how hyper-focused and dedicated they are. 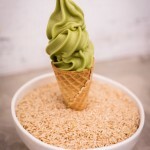 One thing not to miss here is the desserts. There’s the Whisky Chocolate Mousse, Sour Cherry & Yogurt ($14), which is a lot of fun and basically tastes like an alcoholic Cherry Ripe. 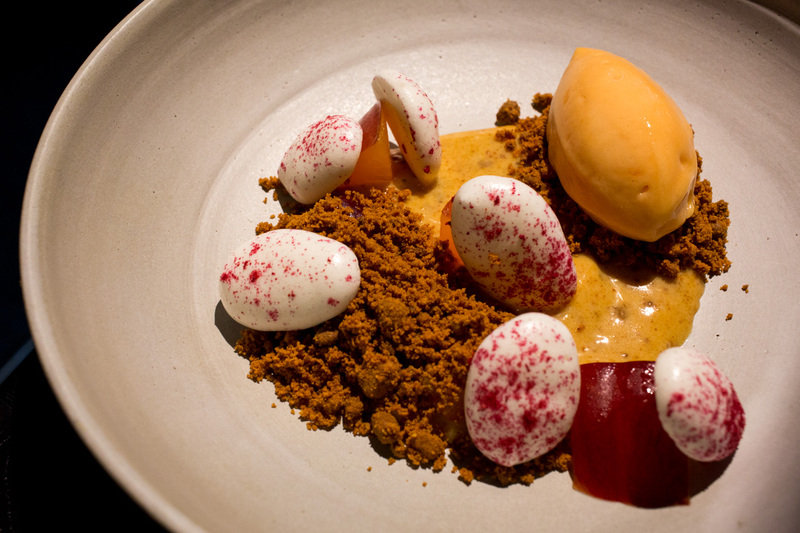 But it was the Nectarine and Sorbet, Brown Butter Curd ($14) that totally spun us out. The burnt butter curd is so addictive that I suggested to Adam Wolfers that he sell it on the street like crack. It’s as delicious as butterscotch, but the lemon curd pulls it back from being cloyingly rich. The compressed nectarine and nectarine sorbet level out the sweetness perfectly and the burnt butter crumb adds a lovely, dish-completing texture. 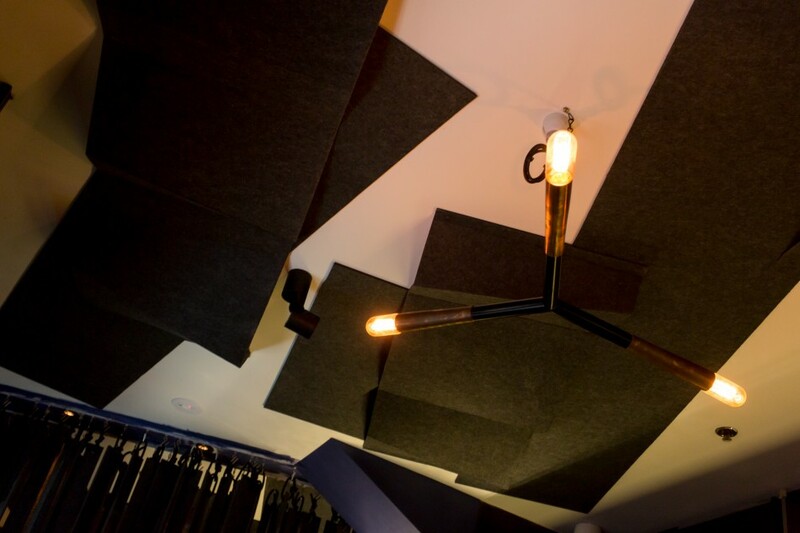 Another thing to like about Monopole: its smart interiors, which look edgy while sneaking in clever elements (like the geometric patterns on the ceiling – they’re actually made of soundproofing material). The design is by Pascale Gomes-McNabb, who added zap and pizazz to Claude’s recently and did the elegant refit of Bentley. So while Monopole’s name derives from the French word for monopoly, there’s no one simple thing that stakes a claim over my enjoyment of this place. The list of reasons, as you can see, is rather long. 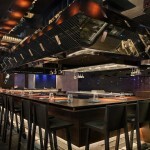 Monopole, 71A Macleay Street, Potts Point NSW (02) 9360 4410, monopolesydney.com.au. You can follow Monopole on Twitter and Facebook. Thanks for your comment, @talkandspoon. Hope you enjoy it. Potts Point is definitely home to lots of new interesting places, so maybe not too big a call after all? hi, can you furtehr explain the ‘Nectarine and Sorbet, Brown Butter Curd’, are the white-ish quenelles the brown butter curds? Thanks for your nice words. The brown liquid at the bottom is the curd, the white part is the meringue. All delicious!